Kim Jong-un likes surprises. The North Korean leader is on a four-day visit to China where he met Chinese President Xi Jinping, the official North Korean and Chinese news agencies said on Tuesday. The two leaders exchanged handshakes, according to Chinese TV footage. 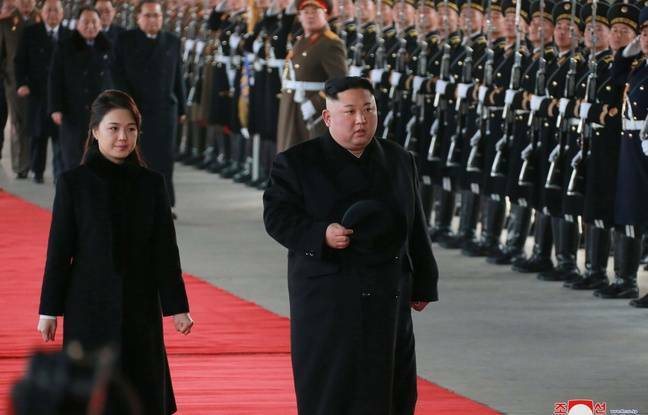 Kim Jong-un, accompanied by his wife Ri Sol-ju and several high dignitaries, departed Pyongyang train station on Monday on a special train, the official KCNA news agency reported. President Xi is behind the visit, KCNA said, and the North Korean leader will be back in his country on Thursday. Before a new summit with Donald Trump? China is an important diplomatic player on the sensitive issue of North Korea's nuclear and ballistic programs, as the Asian giant is its main diplomatic and commercial ally. The meeting could be used to prepare a second summit with Donald Trump, while negotiations on the denuclearization of the peninsula remain a very sensitive subject. Kim, who is celebrating her 36th birthday on Tuesday, an information never confirmed by Pyongyang, traveled to China three times last year to pay homage to Xi. Until his first trip in March, Kim had never met Xi since he came to power in late 2011, with relations between North Korea and its main ally and protector having deteriorated somewhat in recent years.